I'm Leonardo Millan aka LegacyCrono, Brazilian developer! Very blue! Has lines and stuff! Full HD! Hello LDers! I want you to challenge me! I’ll be starting a stream soon, where I’ll play your LD31 entries, but I want to do something a little different. Instead of just playing your games for leisure, I want you guys to send me challenges to be completed! If your game has scores, I’ll try to beat ’em! If your game is hard to complete, I’ll do my best to reach the end! Is there a certain difficult task you’re unsure if it’s even possible to do? Well, I’ll give it a shot! SO LET’S DO IT! You can send your own game, or if you found a really cool game with an interesting challenge, you can send that too! UPDATE: LD Challenger #2 is over, but you can check the VOD below. Keep tuned, we’ll be back to beat more Challenges!! The stream will start later today for a few challenges, and I intend to continue it tomorrow. In the meanwhile, please check out my LD31 entry, “Screen Ego Aegis”! Extreme Fishing now for Android! Extreme Fishing is now released for Android on Google Play! This is my first game since I decided to go full indie in January. Extreme Fishing was originally created for Mini Ludum Dare #24 by me and João Zanini. This new version for Android has new content, better gameplay, improved controls for mobile and Google Play integration. Challenge your friends on the leaderboards and conquer the achievements! It’s also free, so download it right now for your Android smartphones! Now that the dust has settled, I turned myself to porting my LD27 entry “I AM TIME BOMB” to new platforms. First of all, I made a HTML5 port (you can check it out on the entry page). This was surprisingly easy thanks to GM: Studio’s GM8.1 import functionality and HTML5 compiler. So, if you want, now you can try it right now, in your browser! I recommend using Google Chrome, it doesn’t work well with other browsers. Still, it also seems that it doesn’t support all gamepads (damn you, Chrome! ), so you might need to use JoyToKey. Or just download the Windows version, that works with all kinds of joysticks! If you haven’t yet, check it out and have a blast! So here it is, folks! I AM TIME BOMB is my LD27 entry. There are many like it, but this one is mine. I AM TIME BOMB is a multiplayer game. Doesn’t mean you can’t enjoy it alone! It’s a fast, high-octane arcade game about explosions and the hurried panic of exploding in ten seconds. You are Time Bomb, and you’re going to explode. But hey, if you’re going out with a boom, you might as well make it last. So spread explosives through the room in such way that, when you explode, it’ll set up a chain reaction. Compete with up to three friends of yours and see who’ll become the best fireworks. Simple! IT’S SIMPLE: I KISSed to the core, from the beginning. It’s simple, and it’s stupid. This prevented me from going overboard. Simple colors, simple shapes. This was by far my best decision, because it let me do a lot of crazy stuff and left me with spare time before the compo time ran out! GOAL: Right when I started I had a clear goal in mind. My objective was making a multiplayer game. I went with that and, although the gameplay didn’t work very well after all, I succeeded in my goal. So even if it’s not the hottest piece around, I’m still happy that I succeeded! THEME: I stopped worrying and learnt to love the theme. I believe most people saw the theme as a restriction, a constraint (I know I did, at first). But after thinking outside of the box I came up with a bunch of crazy ideas for it. TOOLS: I sticked with what I knew. Game Maker 8 never disappoints me. For music and sound effects, my faithful and dandy FLStudio did the job. WORK WITH FRIENDS: I gathered with some friends to participate in this Ludum Dare. Each of us made a separate game, but just being together helped on focusing and having an immediate feedback on our progress. GAMEPLAY: I wasn’t sure how the game would be played until it was very late. Unfortunately, the way it ended up isn’t very interesting, as it involves too much randomness. I didn’t have enough time to change the gameplay, but I have ideas for an eventual post-compo version. TOOLS: I started using GM: Studio instead of GM8, because I wanted to release it in several platforms to make it accessible to everyone. That wasn’t a good idea because GM: Studio has problems even in its primary platform. I rolled back to GM8 soon enough though, so it wasn’t a big impact. MiniLD #32 is over for me. Although I did not made the number of games I expected to make (mostly because I procrastinated a lot this weekend – as usual), I am satisfied with the result. The first part of my completely devious game-developing adventure was to create a pack of 50 or so games, with a very retro aesthetic. And as it turned out, 50 games was a bit out of hand after putting my procrastination time on the equation, so I felt comfortable reducing the goal to a puny number of 12 games. This pack of games was titled Super Advanced Hyperst-uh… err it’s the title you see above. Also known as 12-in-1 LC Collection. After creating those 12 little games, I decided to make something more complex. My first thought was to create a randomly-generated RPG final boss battle thing. I went as far as to create randomly named characters with randomly generated status, and a menu. And it was actually looking pretty good to be honest. Of course, the random name generator was a bit crazy, generating things like Gridobrezhiu, Equicrocro, Pigrashounen, Her and other bizarre things. Aside from that, works quite nicely. 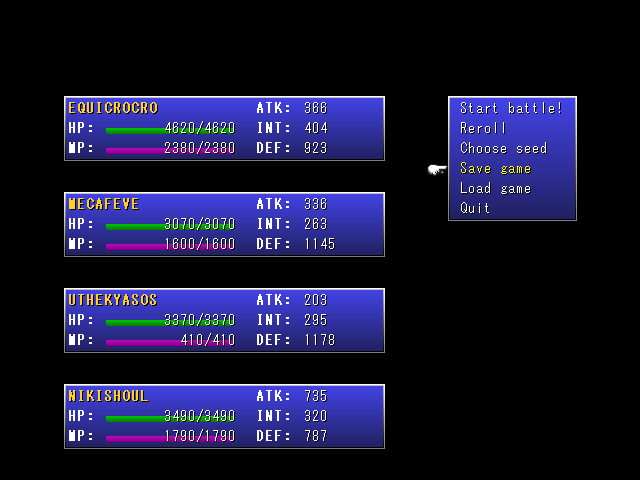 But once I got to code the enemy, I realized it would be way more complex and time-consuming than I thought. So instead I decided to go back and make a platformer instead. At first I had no clue what to create, so I just started drawing tiles, tying things together, coding collision and stuff. Then I had the idea to include a character from my previous game – Subject 0017 from Fate of Mankind, to be more specific. Then I had the idea to make it more or less like a sequel. And then… well, just play it. If you liked Fate, you’ll enjoy Tower of Mankind. Aaand weekend’s over, time to rest and enjoy some games! Anyway, I’m pretty happy with the results and had a lot of fun. You can check out both Tower of Mankind and the 12-in-1 LC Collection on my MiniLD #32 entry page. Mindbane was my entry for the 48 hour competition. If you haven’t, check it out and rate it here: PLAY MINDBANE! The development of this game was a mess, to say the least. To begin with, I had to work on the saturday, so actually I lost ten of the 48 hours doing absolutely nothing. Well, nothing is quite inaccurate, because I was trying to have ideas for the entry. But my brain at 4AM is barely working correctly, so I couldn’t think of anything. I’m prepared! Well, kinda, I’m still in need of energy drinks and ice cream. To the store!! And here’s my almighty operations room, where all cool stuff are created. It’s missing my MIDI controller… *sigh* Damn you, Customs. Of course it's the same of the last time, why would I change?! Get ready, LDers! July’s MiniLD is approaching! Well, the Ludum Dare #21 is coming next month, so I’ll give you guys a relaxing time to tune your programming skills and exercise your game design. The Mini LD #28 will officially start on Friday, July 30th at midnight GMT (that’s July 29th 7:00 PM EST). But to make sure everyone can join the fun and got enough time to work on your submissions, I’ll reveal the theme on July 23rd, also at midnight GMT. You can start once the theme is revealed if you want to, no pressure. Just have fun! If you’re a newcomer and isn’t sure how to get started, try visiting the Tools page to get ready, and read the Sol’s LD Survival Guide. Also, come chat with us on the #ludumdare IRC. Feel free to ask there for help if you’re confused. As always, everyone is welcome to join! All platforms, programming languages and engines are accepted. You’re highly encouraged to share your source code, but this isn’t a requirement. I won’t be picky about assets either, as long as you have the rights to use it. [in]Sanity is finished, and you can see it here: Play! Well, we had to cut most of the game because our artist had to leave early, but it’s still playable and have multiple endings (most of them are death…).